This BioProvince (as defined by Armen Takhtajan) comprises most of New South Wales and Victoria. It also extends slightly into the southeastern part of the state of South Australia. The area lies in a temperate zone and is generally free from extremes of heat and cold. The highest temperatures are experienced in the northwest with shade temperatures of more than 51°C being recorded. One of the coldest places is in the Snowy Mountains, where winter frosts and snow are experienced over long periods. Rainfall varies widely, gradually diminishing to an annual average of 180 mm in the far northwest. In the coastal areas the climate is oceanic and slightly humid while the deserts of the interior have more continental conditions with hot days and cold nights. The geology is extremely complex and comprises rocks ranging in age from the Palaeozoic to recent. The oldest rocks in the far western parts of New South Wales are strongly deformed and metamorphosed and often covered by Cambrian shallow marine to continental sediments and volcanic rocks. Palaeozoic sediments, volcanic rocks and granites, dominate the southeastern parts while basins of Mesozoic sediments occur in the north and west. The Cainozoic Murray Basin dominates much of southwestern areas. The flora includes several endemic genera including Parantennaria, Streptothamnus (which is close to the Chilean genus Berberidopsis), Wittsteinia, the near endemic Lepidozamia, and many endemic species. 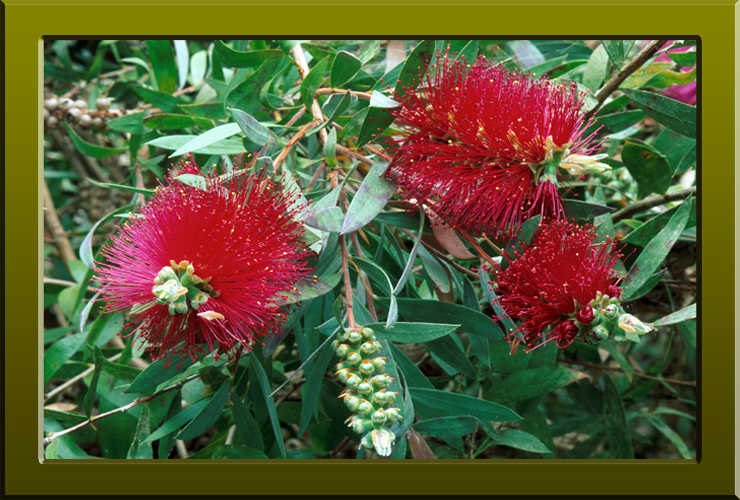 Callistemon rigidus (Myrtaceae) the so-called stiff bottlebrush endemic to New South Wales (Copyright © 2010 Peter Martin Rhind).